​He continued as an itinerant bookseller and actor for the next four years or so until his death in Hartford on January 7, 1821 at the age of 38. Right up until the end John was reported to have been seen in one city or another “with his wheelbarrow of books.” It is not certain how he died, but he is known to have complained of severe headaches likely caused by his wound. John had the admirable traits of being a daring adventurer as well as a perceptive observer who managed to keep his wits about him, and had the presence of mind to record his experiences in a journal. From his early days in Hull, he rejected conventional ambitions and sought to travel the world. He gave up a distinguished apprenticeship in the medical profession to follow his desire to learn his father’s blacksmithing trade. In doing what he loved, he quickly achieved success as a skilled craftsman and was positioned in the right place and time to be invited on the voyage that would define his life. His inclination towards acting and performing was an important thread that ran through it all. Although he may have regretfully sacrificed home and family for the sake of his aspirations, it took dedication and courage to live the life he chose. ​Following his release, John remained aboard the Lydia and essentially completed the trip he had originally signed up for, accompanying the crew on its trading ventures up the Northwest Coast and ultimately to Canton, China where they sold their supply of fur skins at a favorable profit. 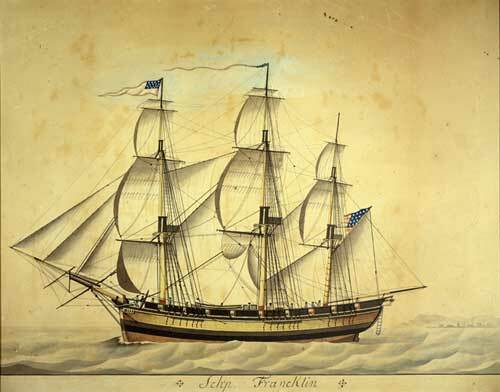 The Lydia eventually made its way back to Boston, Massachusetts in the Spring of 1807. Though in a sense he had made it “home,” remember this Boston was not the one in Lincolnshire where he was born. It was yet another new place where he would need to learn his way around. Although he was truly grateful for having been delivered back to Christian civilization (as he would put it), like a soldier coming home from war, the familiar ways must have in some sense seemed strange to him. ​It is reported that he visited the owners of the former Boston, Francis and Thomas Amory, who were certainly grateful for what he was able to salvage off the ship, and it is likely they set him up in blacksmithing employment of some sort. No doubt he had earned a certain amount from his share of the China trading profits so that he could settle fairly comfortably. We know from church records that on Christmas Day in 1809 he married Hester Jones who was 22. She had emigrated to America from Bristol, England just five years earlier. It isn’t clear how they met, but we do know that she was already pregnant with their first child. In contrast to his wedding day, John may well have been thinking of Christmas Day 1802 when the Boston rounded Cape Horn and his Pacific adventures began. At 26 John had already lived several lives. It may be for this reason, that he didn’t simply settle down into “happily ever after” mode. The couple had three more children in quick succession and moved to the Hartford area of Connecticut. 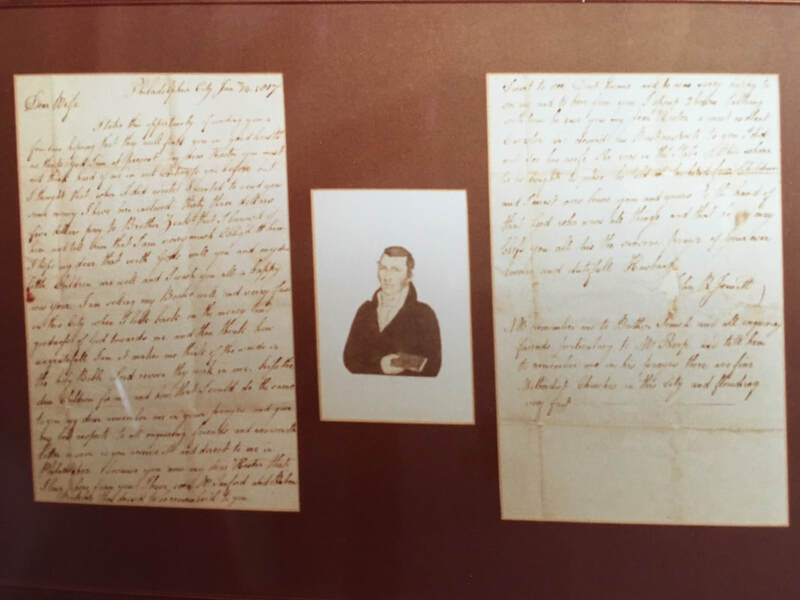 Rather than focusing on a steady job and raising a family, it turns out a good portion of John’s time and attention was occupied with getting his Journal published. 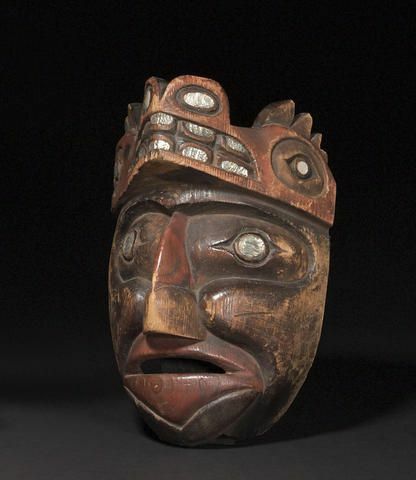 It is likely that a large part of his mind was still immersed in his experiences with the Nootka people. The story of John’s capture and rescue was well-known around the Boston area, and his Journal proved to be a popular publication. Much like today, it never hurts to get your book out there on the heels of a newsworthy event. When it came to the attention of Richard Alsop who reworked it into the Narrative, sales at $1 a copy took off... and so did John -- on a book tour. It seems the life of a published author hasn’t changed much in 200 years. 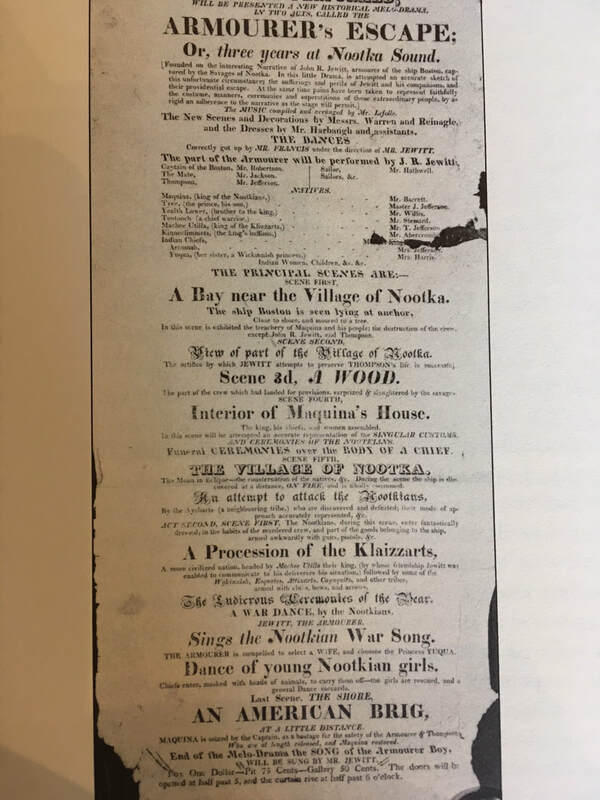 The Playbill that accompanied the performance describes the scenes... “Jewitt the Armourer Sings the Nootkian War Song... The Armourer is compelled to select a WIFE and chooses the Princess YUQUA... Dance of Young Nootkian Girls...” etc. One can only imagine what this theatrical production must have been like! The brig Lydia, a trading ship from Boston commanded by Capt. Samuel Hill, was the first trading ship to venture into the harbor since news of the 1803 massacre that killed John’s comrades had spread among the ship merchants causing them to avoid the area. 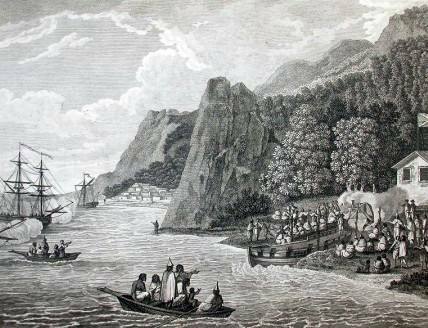 Maquina’s ego and his greed made him anxious to board the ship and resume trade with the foreign merchants; however, he hesitated for fear that the white men would seek revenge for the massacre incident. It occurred to the chief that if John wrote a letter to Captain Hill explaining that he had been treated well by Maquina and that he should be welcomed onboard the ship without being harmed, it might protect him. At this critical moment, John’s greatest abilities as a writer and communicator were called upon as he set about composing a letter that the chief with his limited knowledge of the English language might believe was a letter of recommendation when in fact it was a plea to hold him as prisoner in exchange for the release of John and Thompson. The success of such a plan depended on John’s ability to keep a straight face, pretending he had no interest in escaping from the village when in fact he could barely contain his joy and excitement at the prospect. that moment when my destiny was suspended on the slightest thread." Both men were taking a calculated risk as they eyed each other. It is a testament to the power of the written word, that one simple document with its multiple meanings would determine the fates of these two men. ​ than could have been expected." ​Unlike the narrative, the spare entries in John's original journal give us a sense of how, despite dramatic moments, John's overall time in captivity was not only miserable, it was tedious and boring. Of course, John's entries of necessity, had to be brief. After all, it was quite a feat even to find the opportunity to write, since it had to be done in secret and in adverse conditions. Yet however unintentional, the brief entries with their abrupt changes in topic often verge on the comical. Here's a random selection representing typical entries beginning with his May 21, 1804 entry on the occasion of his 21st birthday. When you think about what a celebration the 21st birthday is for most of us, it really makes you realize just how young and alone John was. This particular entry is unusually long probably because he was feeling contemplative and dejected. It is followed by his poignant and spare 1805 entry on the occasion of his 22nd birthday What he didn't know then, was that just two months later he and Thompson would be rescued. Nootka fish hooks. Perhaps John R. made one of these. - This day I am 21 years of age. I now begin to give up all hopes of ever seeing a Christian country or a Christian face, for season being so far advanced and not hearing of the arrival of any ship on the coast, we feel ourselves very unhappy... We are very much cast down at the thought of spending the remainder of our days amongst these savages. - This day I am 22 years of age. Employed at making fish hooks. Invited to eat whale's blubber. - Natives fishing, &c. Employed cutting fire wood. Invited to eat cockles. - This day our chief told me I must go a shooting. - Natives fishing. I was out for shooting seals; returned, no success. - Arrived a canoe from Ai-tiz-arts with four seals for our chief. - This day our chief had a large feast of seal's blubber. - Employed attending strangers. Invited to eat blubber. - Natives fishing; the strangers went away. - Rainy weather. ** Natives fishing. Employed at slavery. ​ P.M. returned; invited to eat raw herring spawn and cold water. - Employed making a dagger for one of our chiefs, went to prayers for our release. - Natives fishing &c. Employed at slavery. **According to Hilary Stewart, nearly fifty journal entries begin with "Rainy weather." Nuu-chah-nulth man hunts sea otter with bow and arrow. - Frosty weather. Christmas time in my native country, but a sorrowful time for me. Employed cutting fire wood. - Fine and clear weather, with snow on the mountains. Invited to eat salmon spawn. Went to prayers as usual. - This day the natives caught a large number of herring. Employed smoking them. - Natives fishing. I was employed making fish hooks. Invited to eat herrings. - Frosty weather. Natives fishing. Employed making copper rings for our chief's wife. She gave me some fresh salmon to eat. ​* John and Thompson were constantly faced with the choice between starvation and eating unappetizing foods such as whale's blubber which despite his use of the word "invite," they actually had to beg for. "Reduced to this sad extremity, with death on the one side, and matrimony on the other, I thought proper to choose what appeared to me the least of the two evils, and consent to be married..."
"He and his chiefs had held council and determined that I must marry one of their women... That I must consider myself as destined to pass the remainder of my life with them, that the sooner I conformed to their customs the better, and that a wife and family would render me more contented and satisfied with their mode of living. I remonstrated against this decision, but to no purpose, for he told me that should I refuse, both Thompson and myself would be put to death." September 10, 1804 This day our chief bought a wife for me, and told me that I must not refuse her, if I did he would have both Thompson and myself killed.... It is very much against my inclination to take one of these heathens for a partner, but it will be for my advantage while I am amongst them, for she has a father who always goes fishing, so that I shall live much better than I have at any time heretofore. September 20, 1804 We live a great deal better since I got married, for my wife's father is always fishing. I leave the reader to judge of my feelings at being forced to take an Indian for a wife. His feelings must have been very complicated. "We were ushered in with much ceremony... and after having been regaled with a feast of herring spawn and oil, Maquina asked me if I saw any among the women who were present that I liked. I immediately pointed out to him a girl of about seventeen, the daughter of Upquesta, the chief... Her person was small but well formed as were her features... She would indeed have been considered as very pretty in any country. 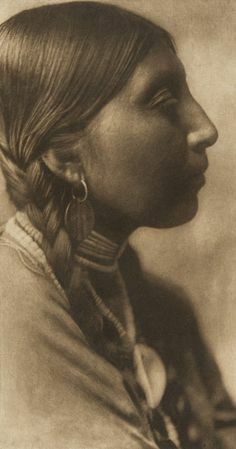 I found my Indian princess both amiable and intelligent, for one whose limited sphere of obervation must necessarily give rise to but a few ideas, she was extremely ready to agree to any thing that I proposed." ​I leave the reader to judge of my feelings on the merit of that statement! March 21, 1805 Our chief gave me liberty to dispense with the girl that he had forced me to take for a partner, which I did with great satisfaction. "Maquina enquired of me how many moons it would be before I should come back again to see him... saying that he would keep all his furs for me, and that as soon as my son, who was then about five months old, was of a suitable age to take from his mother, he would send for him, and take care of him as his own." Wow! A son??? 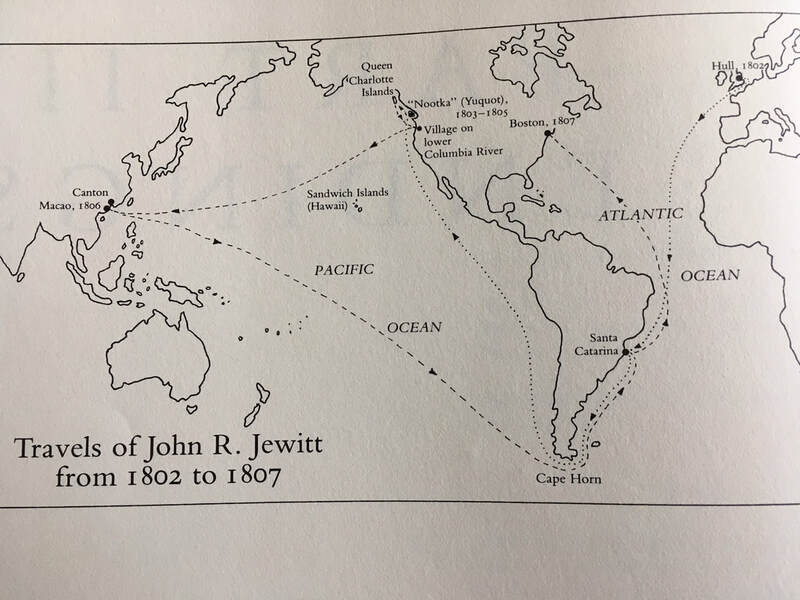 According to Hilary Stewart: "This is the only reference Jewitt makes to having a child, who would have been about a month old at the time he and Thompson were rescued. His simple statement here gives no hint as to whether or not he had known of the birth before his rescue. The infant was born close to nine months after the marriage." So maybe marriage wasn't so bad for John after all! "Marriages were always between people from different clans. When a man decided to marry a woman, he paid her father an agreed amount before the wedding. After the birth of the couple's first child (born into the mother's clan), the wife's clan paid her husband an amount equal to the initial wedding payment. After the payment, then the marriage was annulled and the woman could chose to stay with her husband or leave him." So although puzzling in terms of European social ways, John's story actually fits right into the Indian culture's scheme of things... once a child was born and the proper payment made, the marriage could be effectively ended... and life, such as it was for John, would go on. "Though my comrade and myself fared as well, and even better than we could have expected among these people, considering their customs and mode of living, yet our fears lest no ship would come to our release, and that we should never more behold a Christian county, were to us a source of constant pain. Our principal consolation in this gloomy state, was to go on Sundays, whenever the weather would permit, to the borders of a fresh water pond, about a mile from the village, where after bathing, and putting on clean clothes, we would seat ourselves under the shade of a beautiful pine, while I read some chapters in the Bible, and the prayers appointed by our Church for the day, ending our devotions with a fervent prayer to the Almighty that he would deign still to watch over and preserve our lives, rescue us from the hands of the savages, and permit us once more to behold a Christian land. In this manner were the greater part of our Sundays passed at Nootka; and I felt grateful to heaven, that amidst our other sufferings, we were at least allowed the pleasure of offering up our devotions unmolested, for Maquinna, on my explaining to him as well as was in my power the reason of our thus retiring at this time, far from objecting, readily consented to it. The pond above mentioned was small... the water being very clear, though not of great depth, and bordered by a beautiful forest... a most delightful retreat, which was rendered still more attractive by a great number of birds that frequented it, partcularly the humming bird. Thither we used to go to wash our clothes, and felt secure from any intrusion from the natives, as they rarely visted it except for the purpose of cleansing themselves of their paint." 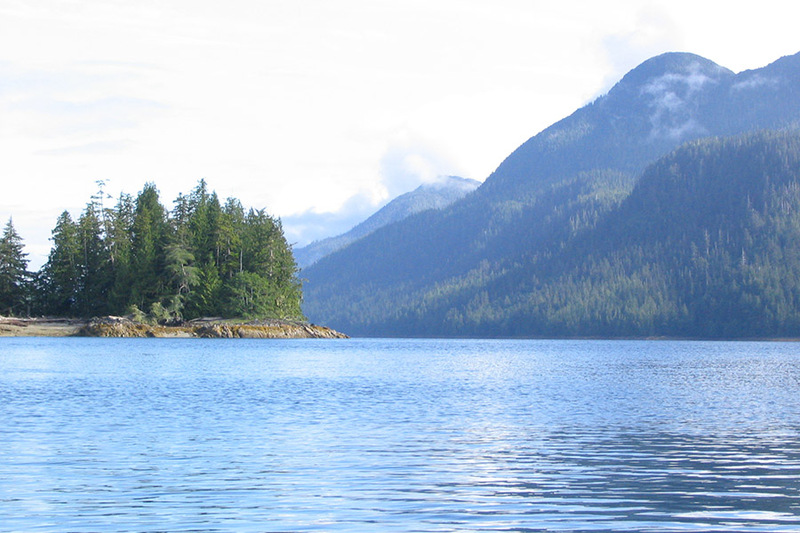 (again Nuu-chah-nulth is the more proper term as opposed to Nootka, the white man's misinterpretation of the actual Indian name for the peoples of this region). What was the Whaler's Washing House? 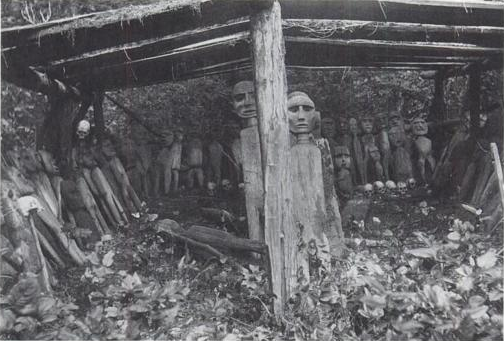 It turns out this was an important sacred shrine situated on the lake on a heavily wooded islet. Also known as Prayer House, it was a place of traditional purification rituals to prepare for whaling. 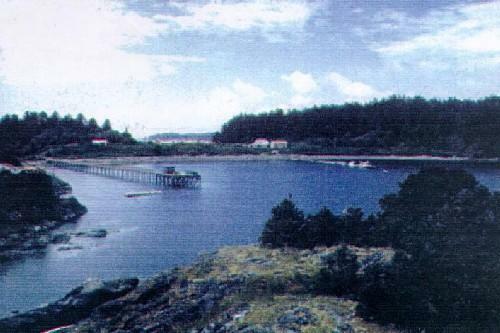 The shrine was first described as a Nootka (Nuu-chah-nulth) ceremonial site by first-hand accounts of early western explorers in 1785. It contained a collection of 88 carved human figures, four carved whale figures, and sixteen human skulls. The actual origin of the shrine is unclear. ​So contrary to John's belief that the Indians only occasionally visted this place to 'wash off their paint' it turns out to have had as great if not more of a spiritual significance for the Indians in their own way, as it did for John and Thompson. It shows that for all that John witnessed of the Indian culture, there were plenty of aspects that he wasn't and couldn't have been aware of. It is interesting that unbeknownst to each other and expressed in very different ways, the same place was sacred to both Indian and white man. What is sad is that in the early 1900's the shrine was removed from its location and purchased under somewhat questionable circumstances for the American Museum of Natural History, where a part of it is actually on display today. That is a whole other fascinating story for another time. Suffice it to say, the descendants of Maquinna and the other indigenous peoples of the area are working to have the shrine returned to its original location at Jewitt Lake. 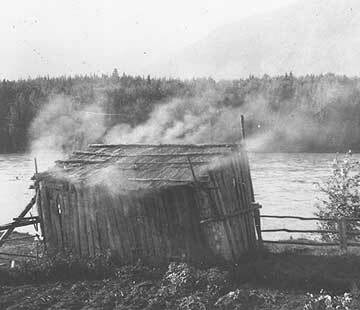 During the next year of captivity, John managed to put aside his fear and misery, and had the presence of mind to observe and record the ways of the Nootka people. With the intellectual curiosity of an anthropologist, he described fishing and hunting methods, food preparation, clothing, housing, and social and seasonal customs. He learned as well, through his metalwork, making daggers, fish hooks and other metal implements according to the orders of Maquinna. 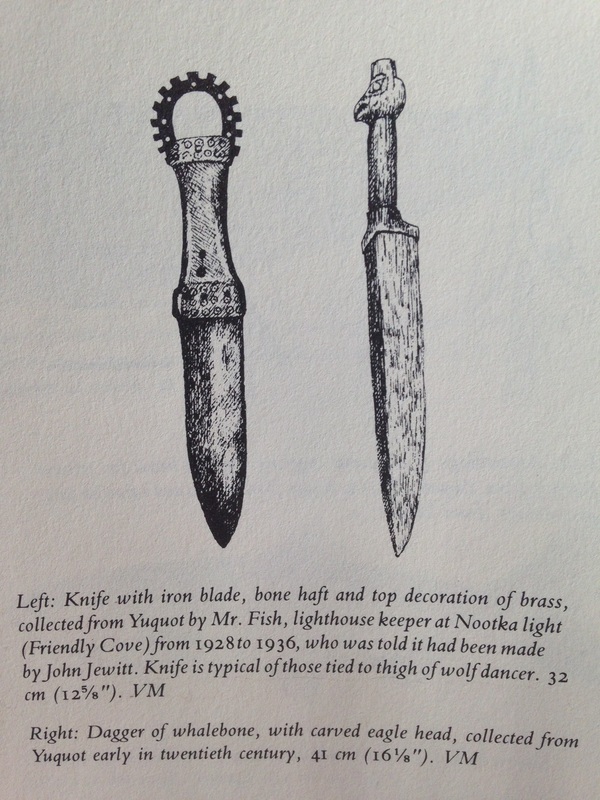 Creating these tools as well as decorative jewelry-like trinkets for the general enjoyment of the people, offered one method of establishing common ground. 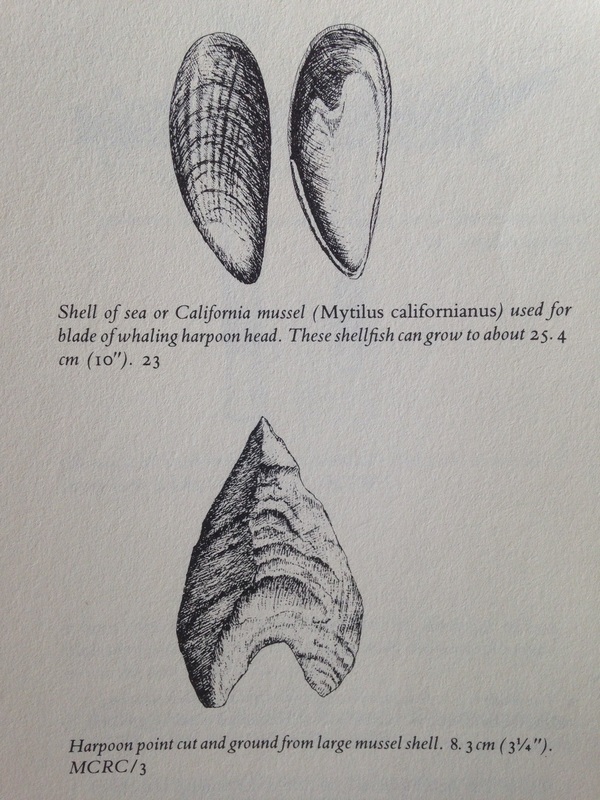 In fact, John was responsible for introducing Maquinna to the use of steel harpoon heads in place of the shell heads which were constantly breaking. Immediately upon switching, Maquinna harpooned the first whale of the season. Needless to say, this improved relations between the king and his slave considerably. "John R. Jewitt Captive of Maquinna"
Beyond that, John learned the language. Like Maquinna who understood the importance of learning English, John recognized that language was a powerful tool he could use to his advantage, and that its nuances told much about the culture he inhabited. treated very ill by them." Here John takes a noticeable pause in his narrative to make a philosophical point about diplomacy and inter-cultural relations. He is careful not to side with the Indians but at the same time, he tries to convey their side of the story. than the principle of revenge..."
Much like today's conflicts around the world, the animosities between Indians and Europeans mostly came about due to lack of communication between very different cultures, that combined with a strong desire for revenge. The young John R. very perceptively suggests that a certain amount of guarded civility would go a long way toward improving conditions for trade and profit to the benefit of all parties. Although essentially they were mortal enemies, and John was in reality a slave prisoner of Maquinna, at the same time they respected each other through language and communication. It is clear from the way John records his experiences that he has a certain fondness for his Indian captor and yet at the same time, against the explicit orders of Maquinna, he was writing in his journal and contemplating means of escape -- composing letters that might be secretly conveyed to a European ship captain should the opportunity ever come. Had Maquinna known, John would have most certainly been put to death. ​Here is what happened that evening, according to the original Journal kept by John R.
After dinner the captain made him a present of a double barrel musket, with which he was much delighted and went on shore. Our people were employed as usual until [a few days later] when the chief came on board with nine pair of ducks as a present to the captain, and told him that the double barrel musket was not a good one and that he had broken the lock; Captain Salter was very angry, called him a liar, took the musket and threw it down into the cabin. The chief returned to the shore very angry and the captain took no more notice of what had happened. 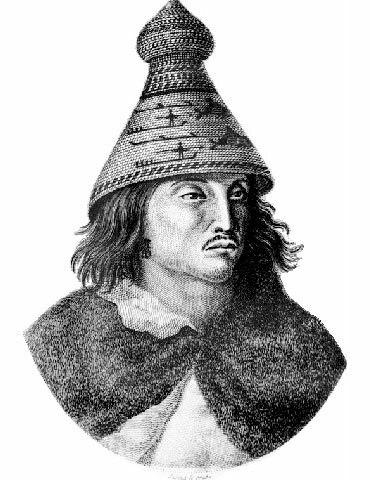 ​Maquinna came alongside with a considerable number of his chiefs and men in their canoes. He had a whistle in his hand, and over his face a very ugly mask of wood representing the head of some wild beast. He appeared to be remarkably good humoured and gay, and whilst his people sung and capered about the deck, entertaining us with a variety of antic tricks and gestures, he blew his whistle to a kind of tune which seemed to regulate their motions. All of this seeming entertainment was actually a ceremonial preparation for the revenge massacre that would soon follow, taking the captain and crew of the Boston completely by surprise. Unbeknownst to the white men who were ignorant and even condescending toward Indian cultures, it was traditional to utilize masks as a bridge to the spirit world. In their belief system, a mask enabled the wearer to shift between the earthly and spirit worlds, thus gaining the extraordinary power needed for success in such things as war, hunting, healing. The natives seized every man and likewise the captain, threw him over the quarter deck, and killed every man with his own knife taken out of his pocket, and cut off their heads and threw their bodies overboard. Hearing a noise on deck, I went and got my musket, and ascending the stairs was caught by the hair of the head, by three of the natives. One of them struck at me with an axe and cut my forehead, but having short hair, their hands slipt and I fell down the steerage. The Chief, observing it was me, told them all not to hurt me, for that I was an armourer and would be of great service to him. I lay in a depolorable state being very weak in consequence of the loss of blood from the cut I received. After they had ... murdered the men that were in the boat they brought their heads which amounted to twenty-five and placed then in a right line on the quarter deck. ... The chief called me on deck and told me that I must be his slave and work for him and he would spare my life to which I of course assented. The chief then told me to look at all the people's heads that were placed in a line at which sight the reader can better imagine what were my feelings than I can describe them. ​This most horrifying and deadly part of the story does not need any elaboration from the narrative version and is told most starkly and powerfully by the journal's direct and minimal description. As John says, it would be impossible to put into words, the horror that he felt that day seeing his captain's and his crewmates' bloody heads, and being forced by Maquinna to identify them excruciatingly, one at a time, all the while knowing that his immediate fate was to become a prisoner and slave of Maquinna. He must have wondered if this was a fate worse than death. But at that very moment, survival was all that John could think about. He was adaptable and a good communicator; the dim hope of escape was out there on the horizon; he knew he would have to use all his resources and keep his wits about him. He couldn't know that it would be nearly three years spent amongst the Nootka tribe, where he would learn their ways and essentially become one of them, even as his only goal was to get away from them. It was going to get complicated. Once the Boston had set anchor, it wasn't long before the first group of Indians paddled out to the ship, led by their highest ranking member, Maquinna. The name meant "moon" and it was one of two ceremonial names held by the chief, the other being tsaxhw'sip, meaning "harpooner." Both of these names indicated his power and status among his peers. In Nootka culture, the moon symbolized the most powerful of beings, the bestowers of good luck and plentiful food; and as for harpooners -- only chiefs were harpooners, those who took on the challenging and dangerous hunt for the whale -- a noble and sacred calling. The whale was at once an intimidating quarry and a significant source of food and other necessities for the Nootka people. The Northwest Coast Indians had a very structured hierarchical society based mainly on material wealth. In that, they had quite a bit in common with their English and American visitors. In recent years, the trade in sea otter pelts had intensified to the point where enterprising Indian traders were smart enough to organize the hunting, skinning, and preparing of the pelts in such a way as to increase efficiency of production. They also cleverly organized and controlled the pricing in order to obtain the highest prices possible -- not unlike a modern day oil cartel. Maquinna was among the successful Indian merchant traders who had become not only wealthy but also savvy in the ways of the white man, learning some English and generally thriving on the power and prestige of mingling with these exotic international foreigners. I was particularly struck with the looks of their king who was a man of a dignified aspect, about six feet in height and extremely strait and well proportioned. His face was rendered remarkable by a large Roman nose, a very uncommon feature among these people. His complexion was of a dark copper hue, though his face, legs, and arms were on this occasion so covered with red paint, that their natural colour could scarcely be perceived. His eye-brows were painted black in two broad stripes like a new moon, and his long black hair, which shone with oil, was fastened in a bunch on the top of his head and powdered all over with white down,* which gave him a most curious and extaordinary appearance. He was dressed in a large mantle or cloak of the black sea otter skin, which reached to his knees, and was fastened around his middle by a broad belt of the cloth of the country,* wrought, or painted with figures of several colours. This dress was by no means unbecoming, but on the contrary had an air of savage magnificence. *The white down was most likely that of a young eagle. The eagle symbolized friendship and good will, and the display of its feathers was part of the unspoken message that meant 'welcome' in all the Northwest Coast cultures. The cloth of the country was cedar bark, which could be processed in such a way that the fibrous wood made a flexible yet durable fabric. Maquinna and Captain Salter sat down to do business over a flask of rum and a simple meal of hardtack dipped in molasses -- apparently a favorite of the Indians. With their close aides (or soldiers) near at hand, it could easily be mistaken for a scene out of "The Godfather." The two could become profitable business associates or just as easily, mortal enemies. And like any delicate high stakes encounter between two very different people, the nature of the results could be triggered instantly by the smallest miscommunication... or inadvertent insult. Once the Boston departed Hull on September 3, 1802, John R. tells us the journey across the Atlantic was pleasant and uneventful, that is after a few days of sea-sickness, he admits. Once recovered though, he says his health and spirits were never better, and he worked hard not so much involved with the sailing of the ship but as armourer, forging daggers, knives and small hatchets for the Indian trade -- never imagining of course, that these very weapons would one day be used against him and his fellow crew members. It took 29 days to reach Captain Salter's planned stop at St. Catherine, an island off the coast of Brazil. It was a well-known stopping off point where ship maintenance could be done and the crew could go ashore to gather provisions including wood and fresh water from the springs. Once they again set out on their voyage, it was another 36 days before Boston could round the treacherous straits of Cape Horn at the foot of South America, known for its rough waters where the Atlantic meets the Pacific. The fog, ill-winds, dangerous currents and rough weather repeatedly forced them back. is made to Christmas Day. As hard as it is to imagine now, apparently Christmas was not a very big deal until later in the 19th century. But whether they recognized the day or not, they certainly must have celebrated. That Christmas gift may have also been a good omen as John reports that from there on, the winds were favorable, the weather fine and the men were able to relax a bit from their duties, even enjoying music on Saturday nights played by some of the crew members. What a time it must have been singing and dancing under a moonlit sky in the middle of the Pacific. 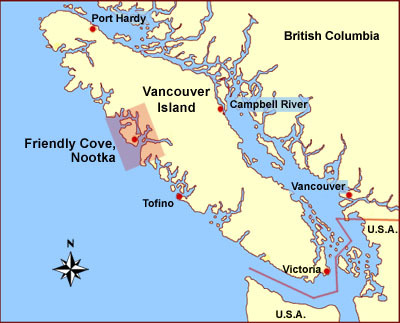 ​And so they continued on until March 12, 1803 they reached Nootka Sound, an inlet on the rugged west coast of Vancouver Island. ​This was Captain Salter's intended stop where the crew could resupply the ship again with wood, water and other supplies before continuing on up the coast to trade for furs. Here, it was said, the local Indian population was more friendly than elsewhere, such that the harbor had come to be known to Europeans as Friendly Cove. The local Indian village was known as Yuquot, and it was ruled by the powerful Chief Maquinna, whom they were soon to meet. Marvinas Bay at Nootka Sound where it is likely the Boston anchored.